Basically, I think I will be all set for preparing my race day meals. The challenging part for me has been learning how to eat for reaching my everyday training goals. For the past 5 years, these sessions have always been completed first thing in the morning, on an empty stomach. It didn’t matter how well I performed, as long as I was moving for long enough to count it as a workout. Now that I am triathlon training, I have to try and reach certain goals; a 600m swim one morning, a 6km run the next, a 6km bike ride followed by a 3km walk the next. And it isn’t really working. I need fuel in my tummy to reach those targets! Embarrassingly, when I first learned how to run pain-free, I committed to increasing my run by 1km each week. Bear in mind that I try to run properly twice a week (that is, with no mash-ups or other factors involved) and so far, after 4 weeks I have not done a run longer than 6km. Last Thursday morning, I got to 4km and everything felt heavy, uncoordinated, dizzy. I actually struggled to get to 5km. It was clear that something needed to be fixed. So I decided I’d experiment with eating something before I go to the gym on my running days. Easy enough if I’m running at night, but an alien concept to my stomach at 5 o’clock in the morning. I started with a banana – harmless enough, I thought. Except, at 5am I am literally running around the house like the lovechild of a gym-junkie and a zombie – and bits of banana went everywhere. I was eating and filling up the dog’s bowls, taking rubbish out, plaiting my hair, filling water bottles… it wasn’t pleasant. Everything ended up with banana on it. Secondly, I couldn’t decide whether to clean my teeth before or after the banana. Is it just me or is cleaning your teeth within 3 seconds of scoffing a banana a bit horrible? But on the other hand, isn’t trying to eat a banana while your mouth tastes of mint very… weird? I definitely didn’t enjoy the mint and banana mash-up. Thirdly, remember that the concept of eating before my morning workout is an entirely unknown concept to my stomach. So from the minute I got up and stuffed the banana down my throat, my body wanted to reject it. For 5 safe and happy years, my tummy has been able to wiggle up and down in the mornings untroubled by stomach acids. Hell knows no fury like a stomach churned. So, when I jumped on the treadmill some 30 minutes later to start running, I turned into a Vitamix blender. That glass of water I downed when I woke up? It sat in my stomach sloshing up and down, around and round, gradually making a banana smoothie which has put me off juicing for the rest of my time on this planet. The banana is a no-no. 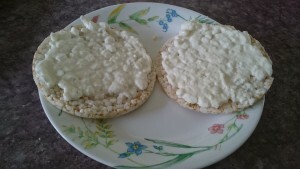 I tried the rice cake and cottage cheese combo (pictured above) for my second attempt… which was just as bad. If I could have written VITAMIX on my forehead and sold myself for two grand, I would have done so. I think the way they describe it on the ad is ‘cyclonic action’ and I would say yes; that is very close to what my stomach was achieving. If you haven’t tried them before, these things are delicious. Although the healthiness is a bit confusing – they’re not really that healthy even though they are made of seeds. 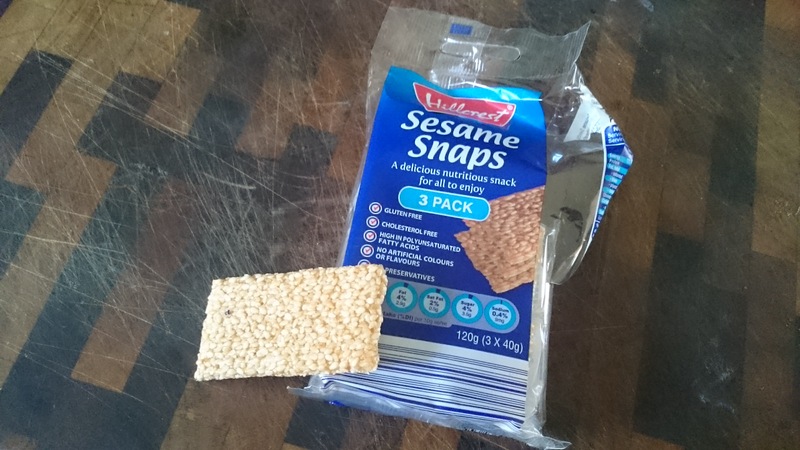 Plus, they come in a pack with three mini packs inside, but each mini pack contains four ‘snaps’ and a ‘serving size’ is only one snap… er, what? Basically if you get a calculator out, eating one of the mini packs gives you about 20g carbs almost entirely from sugar, so easy for my body to use when running. Less carbs than a whole banana but not by much – definitely enough to sustain a run, I decided. The morning of my next date with the treadmill, I broke out the snaps. The first advantage was that I did not look like an ape galomping around the house trying to stuff a banana into my gob. The snaps were far more ladylike, which Matilda the dog appreciated because she likes to pretend we are a fine, upstanding family. 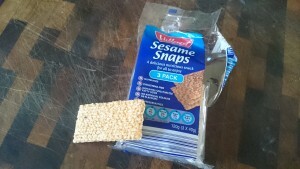 I will also admit that the snaps felt more like a treat than a banana or rice cakes, so I enjoyed eating them more, too. Cleaning my teeth straight after was bearable, because apart from being very sweet and sugary there isn’t an overwhelming or lasting flavour from the snaps. All ticks so far. I drove to the gym and got on the treadmill. No Vitamix! I comfortably made it to 6km and felt like I could have gone further, but I was out of time and had to get ready for work. 7km next time – and then the snaps and I are coming for you, 10km!! This entry was posted in Everything Else, Show Me Run and tagged beer, dog, newbie, running, strategy, training. Bookmark the permalink.